June 29 th, 2007 : Sunny and Hot, Water temp 84*. Caught bait early and picked clients up at 5:30 at their dock. Hit the mouth of their creek and set up on a small school. Caught a few punks and moved on. Set up on a couple of other schools in 40 foot of water, seeing plenty of fish but primiarly smaller fish were feeding. Went to shallower flats and found 4 or 5 more schools and the rods stayed bent over but still most fish were small. Today we had over 300 strikes and caught about 50 fish. Caught 200 baits in 2 casts this morning and waited at the marina for my clients to show up. Took them a short distance from the marina and put them on a small school of Stripers to get them oriented to running downlines. Didn't take long for them to understand so they were ready to tackle a larger school. Set them up on one in 40 ' foot of water and we caught some nice Stripers. We went through the baits by 8 so I went and caught more. Set up on a school in 25' of water and limited out easily. Again we had over 200 hits this morning catching plenty of Stripers and a few Kitties. Owen is holding one of the nicer Stripers caught this morning. June 27th , 2007 : Water Temp 84* and Clear. Got on the lake early to catch bait but only caught about 100 which is not enough to get started. Picked clients up at the dock at 5:30 am and also met John and his clients. We decided we would double team the fish this morning so John went up and I went down to search for the massive schools of Stripers. I caught some more bait and went just a short distance to locate a school. 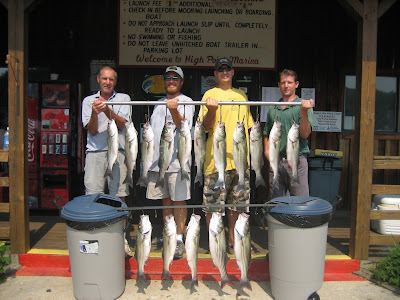 We set our downlines out and put the Herring in the Stripers faces and the fun began. 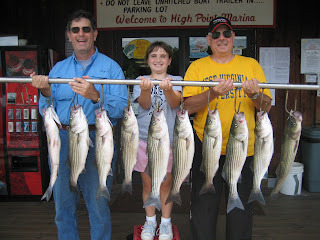 Once we put a few fish in the boat I called John and told him what was going on and he decided to keep looking where he was, for they had put two Stripers in the boat and he felt a nice school had to be nearby. Our crew learned very quickly what it took to put the fish in the boat and we worked on the Stripers in this school for 45 minutes before we lost them. We searched for a couple minutes for another school when my phone rang , John had found the 'mother load' and had four fish on and hollered " Get up here NOW" . I obliged him and ran up to him and had just set the lines out when ours started getting banged. Johns crew and mine worked on this school for awhile until I ran out of bait. We had already gone through 200 baits and I went and caught more. John continued to catch fish while I caught bait and when I got back to him they were reeling in Stripers. We set up again and had another 40 hits before we called it a morning. 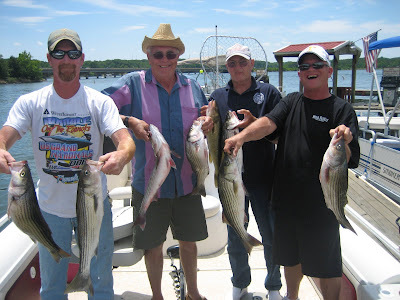 By 10am Johns clients and my clients had boated over 70 Stripers and a half dozen Cats. Both of our sets of clients were wore out , hot and had a great morning. June 27 th, 2007 : Water Temp 84* and Clear. John is pictured with his clients this morning. 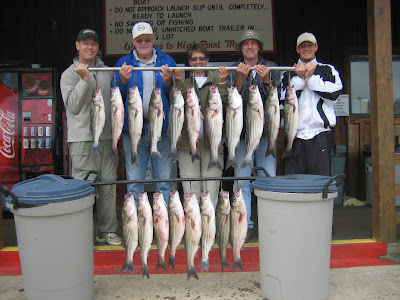 He and his crew caught over 30 Stripers this morning and kept these 16 nice Stripers to take home. See above entry for more info. June 26, 2007 : Sunny and Warm, Water temp 82* and Clear. Caught bait and went in search of Schools of Stripers on 35' flats. Located some smaller schools early that were not formed well and left them hoping to find larger schools and it didn't take long. The fish this morning must have been feeding pretty shallow because where I found them the majority of the school was 26 to 32' deep, just coming off a flat. We set up at 30 ' but I kept seeing fish shallower so I sped the boat up to keep the lines off the bottom and we started putting fish in the boat. The first round lasted about 45 minutes having over 100 strikes. We moved a short distance and relocated the school and used up the rest of the 150 baits I had in the tank. Went and caught more bait and set up on two more different schools , one on a point dropping from 28' into 35' and the other school was on a flat in 38' of water. 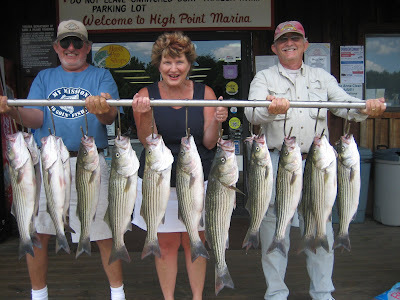 Today clients had over 200 strikes boating 35 Stripers and 6 Cats. June 24 th, 2007 : Cloudy and cool, Water temp 82*. Caught bait easily this morning ,picked clients up at 5:15 and snuck out of the marina without anyone following me. Went right to a school of Stripers and had the crew put the downlines baited with herring right in the Stripers face and the action began. We worked on that school for 45 minutes then I located another school on a ledge in 34 feet of water and for the next 45 minutes did it all over again. 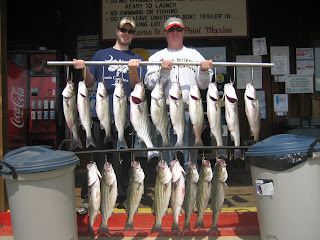 By now we had had 175 strikes and went and caught more Herring. I went right back to another ledge in 35' and all the lines hooked up. 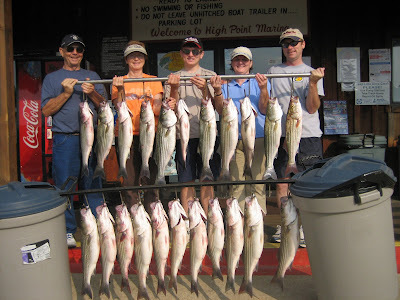 Today we were not dogged by other boats which allowed us to fish unhampered and the results were wonderful. We came off the water this morning around 10, clients having over 200 strikes for the morning and keeping 16 nice Stripers to take home. Lost count of how many fish we caught this morning. June 23rd, 2007 : Sunny and Pleasant, Water Temp. 82* and Clear. Had some trouble catching bait this morning so I picked clients up at the marina and went up lake and caught enough Herring so I would have 200 to start. Found a school of Stripers and the fish started hitting before the guys could get their lines out. I don't think the crew was prepared for this kind of action , it took them 30 minutes to get it together. After working the school for an hour every boat in the lake was on top of me and we had to move. We set up on some other schools but the Saturday traffic got bad early and naturally spooked the larger fish. 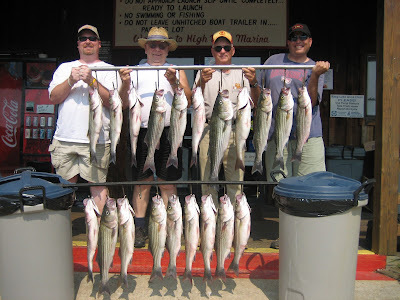 We fished hard today, had well over 250 strikes , clients catching about 35 Stripers, a few Cats and a Walleye. June 22nd, 2007 : Sunny and Pleasant, Water Temp 82* and Clear. Picked clients up at the dock this morning at 4 am[ they wanted to help catch bait] and set out on our adventure. After catching bait we located a school of Stripers at the mouth of a creek and worked on them for 2 hours. Time flies when you get 150 strikes in a time span of less than 2 hours. [More than 2 strikes a minute] We went and caught more bait and set up on another school in 32 to 36 foot of water with enjoying the same success. By 10:30 the fish finally turned off but not before treating us to another 200 strike morning. 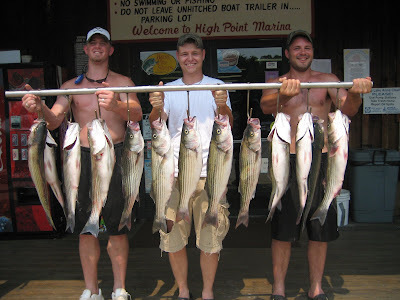 We caught over 30 Stripers this morning and 10 Catfish. Clients kept 16 Fish to take home. 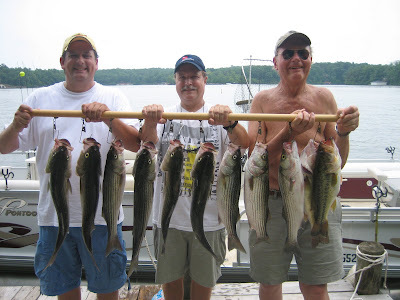 Lake Anna Striper Guide Service is proud to welcome John Chadduck to its guide team. [John on left] John is pictured with his clients Dan and Trina who he guided on a half day trip this morning. 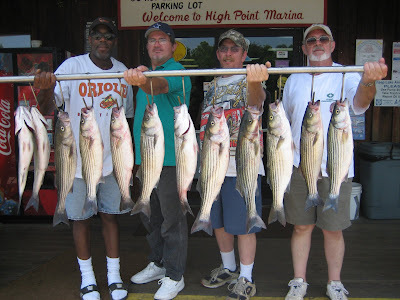 They caught 11 Stripers and kept these 8 nice fish. 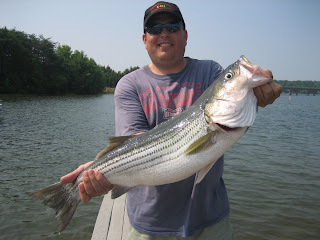 John has been fishing for Stripers the last 15 years with 12 years experience on Smith Mountain Lake and the last 3 years here on Anna. 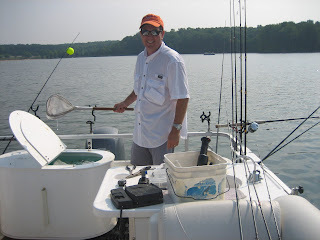 He is a well seasoned live bait fisherman and an expert troller [employing up to 5 rods at a time]. He fishes out of a Pro Sports Deck boat which is fully equipped. 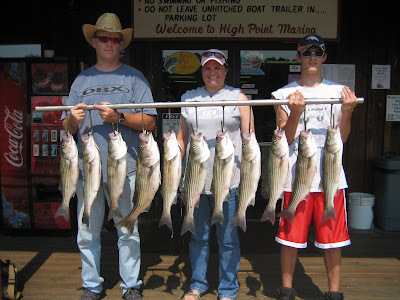 John will entertain 1/2 day trips [Trolling] and full day trips either trolling or live bait. Nice catch! June 21, 2007 : Sunny and pleasant. Water Temp 81* and Clear. Caught bait early and picked clients up at High Point at 5:30. Checked a few 30' flats and set up on one that was holding a few fish. After showing clients how to put lines out and catching a fish I pulled off the small schools and searched for a larger one. Since there were only 3 of us I did not want to set up on a 'mega' school because if we got on anything that big it would be too hectic to enjoy. We hit a school that produced just enough strikes to keep us very busy and we all kept up with the action. It didn't take long before we had our limit and by 9:30 the fish turned off anyway. We kept 12 Stripers this morning, clients and I splitting up the fish. Thanks guys. June 19, 2007 : Sunny and Hot, Water temp 83* and Clear. Caught bait easily this morning and picked clients up at 5:30am. Searched uplake flats for awhile but the fish were feeding on and near the surface and were not schooled up well enough for down lines. It took about an hour for the fish to get where I wanted them but when they did we wore them out with our Herring on down lines. The Stripers bit steadily for an hour and a half, and probably would have kept biting but we ran through 175 baits and had to catch more . Found a school of Herring easily and made a couple of tosses and put another 200 baits in the tank and set off to find some more fish. Didn't take long to locate a feeding school and proceeded to nail the fish again. The action was so steady that by 11 am we finally noticed how hot it was and tried to call it a day but the fish would not leave us alone. I eventually pulled off the fish and headed back to the marina. I worked my clients pretty hard today, we had at least 275 strikes this morning catching 20 Catfish, 3 Largemouths and who can count how many Stripers. Anyway, the guys took home 20 beautiful Stripers , 3 of them around 10 pounds, and sore hands from fighting and handling Stripers. June 17, 2007 : Sunny and Hot, Water temp 80* and clear. Caught bait easily this morning and picked clients up at 5 :30 at High Point. Set up on a small school over 35 foot of water and put a few Stripers and Cats in the boat. Went uplake to a 25' flat and replayed the first event, 4 or 5 Stripers and numerous Cats. Looked around for a bit and really did not see what I wanted to so I made a move back to a deeper flat and located a huge school in a channel bend. What can I say, 3 guys ran around the boat like chickens with there heads cut off trying to keep up with the action. These guys did exceptionally well though , it wasn't their first time out with me. When it was all said and done we had over 200 strikes this morning catching about 30 Stripers and 20 Catfish. 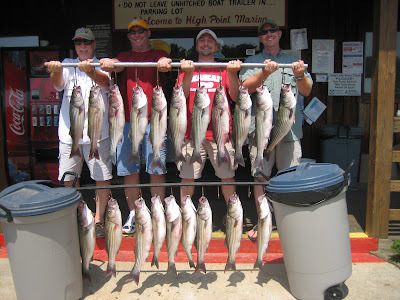 We got off the water before it got too hot but the guys will have their work cut out for them this afternoon, they kept most of the Cats and some of the Stripers. June 16, 2007 : Sunny and Pleasant, Water temp 79* and Clear. Got out early this morning to catch bait but it was tough going, only caught about 40. Picked clients up and went uplake to catch more bait. Found a school easily , made 1 toss and put 100 more Herring in the tank. Set up on a small school nearby to let clients get some practice on how to put the lines down and reeling in the Stripers. After going through 35 strikes we caught some bait for a friend and set up on another school nearby also. Put a few fish in the boat and the crew was ready to hit a major school. I looked for about 5 or 10 minutes and only saw fish stacked on the channel ledges. Called Anthony who was fishing today to see if he had found anything and all he had to say was "The screen is Black". I knew where he was and flew to him as fast as the boat would go. I got about 100 yards from him and I started seeing arches on my Lowrance so I shut the motor down and started the drill. We got most of lines in and the fun began. For the next 30 minutes it was a great team effort, I baited and netted , Bill and Art put the lines down and reeled fish in while Patty fought fish screeming " it's too hard , I can't do it " but in reality she reeled every fish in she had on. Overall the day was not too bad considering a major front had moved through the day before and the Saturday boat traffic was hateful. 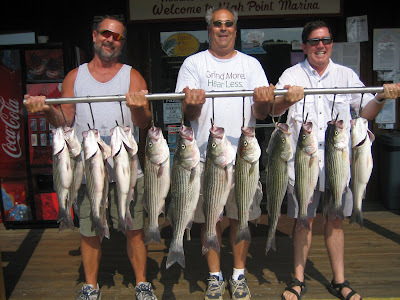 We caught 25 Stripers and 16 Cats today with clients keeping 10 Stripers to take to the Grill. June 14, 2007 : Rainy and cold, High 60*, Water Temp 80* and clear. Picked clients up at High Point at 5:30 and went searching for fish. We had a terrible storm come through last night and blew in a major cold front with East winds today. I already had two strikes against me and I wanted to do especially well today because I was taking out a friend and his family who had been looking forward to the trip for quite awhile. Looked for a few minutes and mostly saw individual pods of fish scattered and set up on one but before we could get 3 lines out a buzzard did a 30 yard circle around us on his big motor and spooked the fish so we picked up and looked for a better school. I tried to set up on 2 or 3 other schools but this jerk in a Procraft would drive right over us every time we put out lines. I kept calm and looked for and found a nice school in 30 foot of water and we got our lines out before the nut ran over us and we started putting fish in the boat. Before we got all the lines in the action began and as long as we could keep a few baits in the water the Stripers would jam our offerings. We worked on the school pretty good before moving on. 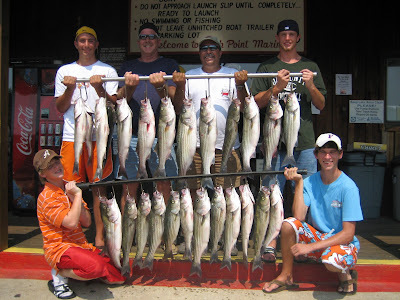 [By the way, The jerk in the Procraft and his friend stayed within 20 to 30 yards of us while we caught 17 keepers and they never boated a fish] We used up about 130 baits in that melee and went and caught more bait. We set up on numerous pods of fish but never could locate a decent school anymore. After the 7th or 8th time the Basshole ran over us when we would try to set up on fish I had to have a talk with him about Sportsmanship, courtesy and a few other topics. His reply was" I didn't know that my motor would spook the fish", DUH. We did not see him anymore today. 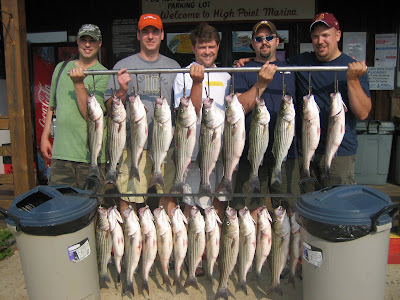 We ended up the day catching 28 Stripers and over a dozen Terd-Rollers. Clients kept 19 very nice Stripers to take back to West Vergine. Hopefully the weather will be better tomorrow and fishing will get back to normal. Although my clients could huddle under my top when it rained today, I believe they got quite chilly numerous times . What a nasty cold day for the middle of June. June 13, 2007 : Sunny and Pleasant, Water Temp 80* and clear. Caught bait early , picked clients up at 5:30 ,set up on a 35 foot flat and started catching Stripers. All was going good for awhile till we looked up and 7 other boats were on top of us which hindered me following the school. There are only 100 schools on the lake at it would seem that occasionally "fisherman" could find there own fish verses continually encroaching on my clients. Anyway,,, We worked a couple of schools and before we knew it we had gone through 210 baits. 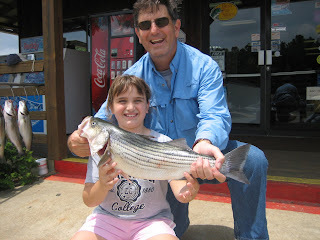 We went out and caught more bait, found a school of Stripers away from the rest of the crowd and had some fun. Today we had over 225 Strikes, boated 17 Catfish and 36 Stripers, clients keeping 20 Stripers and releasing everything else. June 11, 2007 : Sunny and Pleasant, Water Temp 80* and Clear. Went to catch Herring early , hung lights out and the bait tried to come to it but the Stripers wanted the bait more than I did so I put out 4 rods, hooked up on all of them, released all the Stripers and they left the school of bait alone long enough for me to throw the net to catch 200 Herring. Picked clients up at 5:20 and searched for about 4 minutes until I found a nice school of fish. I had already instructed the crew on how to put the downlines out so I baited up and everything we had went off. For the next hour and a half my clients steadily reeled fish in. I pulled off the school to look for others but really to give them a break and realize what had just happened. I let them rest for 5 minutes then put them back on a school and before long we had gone through all the baits. We used 200 baits up by 8:15 and everyone enjoyed the morning. Couldn't have done it without Rick helping out. Can the fishing get any better? June 9, 2007 : Sunny and warm, Water temp 82*. Picked clients up and located a small school of Stripers nearby the marina with in 10 minutes of leaving the dock. Set up on them with downlines and the fish started biting. Stayed with the school for only about 30 minutes before it petered out , tried to relocate it with no luck. Continued to look for the large schools that we had been fishing all week but all we could find were small pods of fish. We set up on some of them with limited success. Before long the Saturday traffic was rocking which did not help matters much. 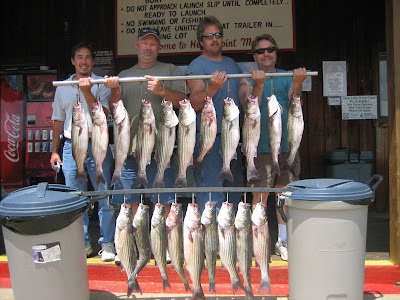 We looked and fished , looked and fished for the rest of the trip but could not find Stripers ganged up. Don't know if the strong front that moved through last night broke up the schools or how much the weekend traffic affected the bite. 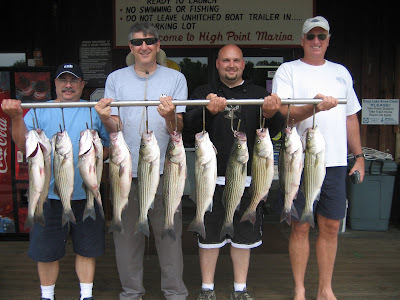 Anyway, we had about 80 strikes today , catching 23 Stripers and a half dozen Cats, Clients keeping 12 Stripers . After today I have a Love-Hate feeling for the Lake. Love fishing it in June and July but hate it on the weekends. June 8, 2007 : Sunny and Hot , Water temp 81* and clear. Got on the water early to catch bait and picked clients up at High Point Marina at 5:30. Set up downlines on a couple of small schools early just to acquaint them to the way we fish. Once they had it down I put them on a large school of Stripers in 35 foot of water and the fun began.We had 8 downlines out and it was all we could do to keep the rods baited. We worked this school for about 20 minutes but after 8 or 10 boats who saw us fishing kept running through the school they turned off. I left there and set up on another school that was just as large and continued to wear the Stripers out. 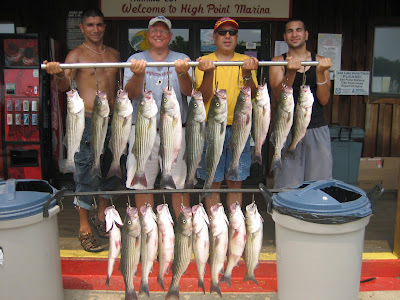 It was going to be very hot today but by 9 o'clock we were back at the marina with this great stringer of Stripers . These guys really did well fishing this morning making very few mistakes and putting most of the fish we hooked up in the boat. Job well done. June 7, 2007 ; Sunny and warm, Water temp 80*. Caught 200 Herring early and picked the crew up at 5:30 at High Point Marina. Took about 5 minutes to brief the crew and set up on our first large school of Stripers. Didn't take long for the action to begin, it became pretty hectic once I put the guys over the school. There were a couple of "Buzzards" watching when I was setting up and once all our rods hooked up they moved in on us . Within 10 minutes we had 30 hits and 8 Boats on top of us . We worked the school for another 25 minutes and I decided to leave the fish because it was getting too crowded. 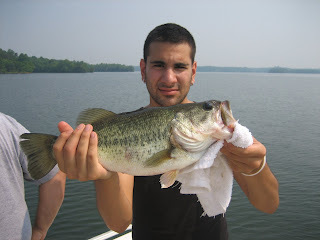 I ran across the lake where I located another nice school and again we started putting fish in the boat. After 15 minutes another guide who saw us catching fish moved in on us so I decided to leave that school and find some other fish. By now we had used up 150 baits and had to go catch more. We caught bait and set up on yet another school and finished out the morning. We came off the water at 11:30 after probably 175 strikes, clients keeping 20 nice Stripers. June 6, 2007 : Sunny and nice, Water Temp 79* and Clear. June 5, 2007 : Sunny and windy, Water temp 79* and Clear. Caught bait early and picked clients up at 5:30 and went in search of schools of Stripers. Most bait and fish early in the morning were in 15 to 22 feet of water so I started out on a 25 foot flat running downlines. As the sun rose I gradually moved deeper with the fish. We encountered many schools today, most of which we took fish from. I pulled up on one school where for 20 minutes we could only get 3 to 4 lines in the water before they got jambed and we would put a line in and before we could bait another the first one would go down. We decided to leave this school because they were eating all my bait up. Today we fished 5 or 6 major schools , had in excess of 200 strikes, clients catching over 60 Stripers and 6 or 8 Cats, with clients keeping 16 nice Stripers . I am sure this is a day my clients will never forget. June 4, 2007 : Sunny and Pleasant, Water Temp 79*. Picked clients up at their dock at 5:30 am and went looking for some more bait. The water has cooled off 5 * due to the rains and bait was hard to come by this morning before daylight. One reason was the Stripers were working on the Herring as I was trying to catch them. Looked for bait for an hour with little success so I decided to set up on a small school of Stripers just to get my clients oriented to my system. After they got the kinks out I went and caught more bait and picked up the girls at the dock at 9:15. I set up on a school of fish and just got out my 8th downline before the madness started. Every line got hit and for an hour it looked like a fire drill in the boat. 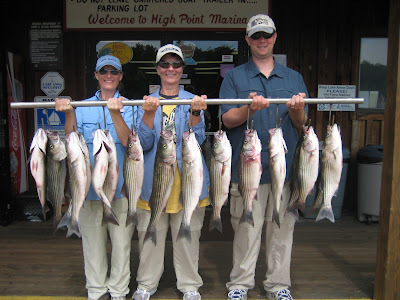 We all worked great together [and it was work] to keep bait in the water and get the fish on the boat. With so many hands we could manage all the hits and not tangle up any of the lines. I think it might have been a little too strenuous for the little ones because after an hour of battle they were played out. 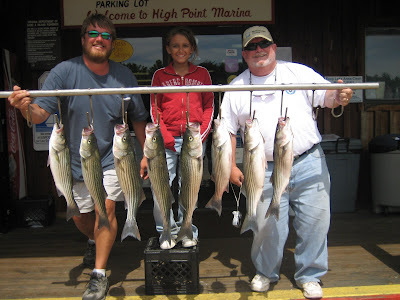 I had to take them back to the dock and by 11am we had 200 hits , lost count of how many fish we boated , with clients keeping 19 very nice Stripers to take home for Patricia to clean. The reason for two pictures is 6 people would not fit in the picture properly and two family pictures were nice. When I left to go back to the marina we left a school of fish that spread over at least 40 acres., being conservative. 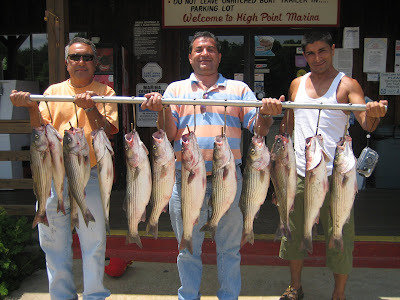 Every day we are catching larger and larger fish and without a doubt if we wanted to stay out longer and could store enough bait we could easily catch over 100 keeper Stripers . June 1, 2007: Sunny and Pleasant, Water Temp 83*. Caught bait early and picked clients up at High Point at 5:30 am and motored a short distance from the Marina to demonstrate how to put downlines down. We fished 30 to 35 foot flats this morning running Herring about 26 feet deep. At 6 :45 Kyle told John "Its not even 7 o'clock yet and we have already had 50 hits! Well we used up 125 baits and I went to catch more Herring and while I was running I noticed a large school of Stripers on the graph . I found a school of bait and threw twice and caught about 120 Herring and went right back to where I saw the school of Stripers, put baits in their faces and wore them out. The picture of Kyle standing in the back of the boat is shortly after he tangled 4 or 5 lines up reeling in a punk. 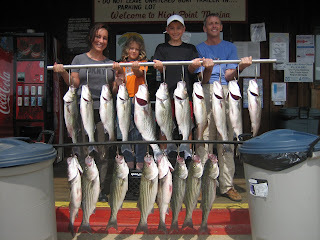 Anyway, today we had over 150 strikes , catching over 50 fish and clients taking home 16 nice Stripers, all before 10 am. 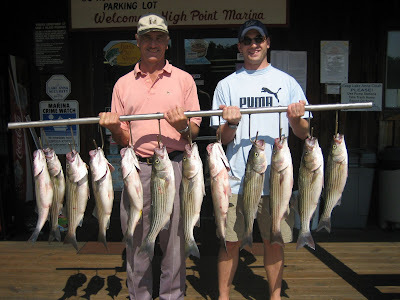 June marks the beginning of our summer season and it is not uncommon for my clients to boat 100 fish a morning.